We have a wonderful slate of events coming up in the next months. 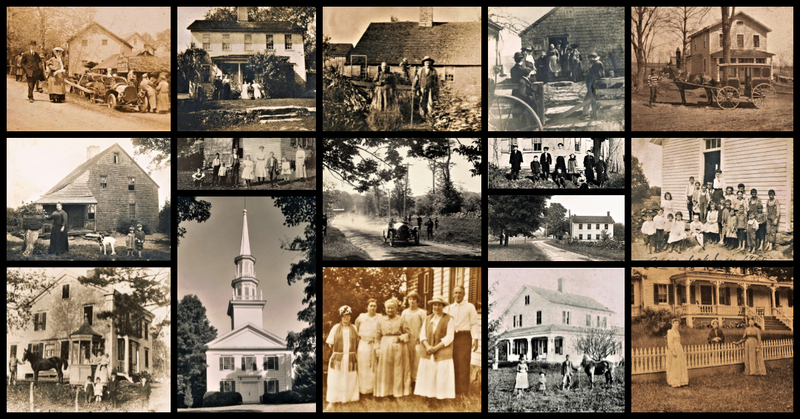 Visit the page Upcoming Events to see a full slate of scheduled events and a brief write up on each one, and stay tuned to the website for more announcements of events sponsored by The Historical Society of Easton, CT.
Next up: Friday, July 19, a BYOB Cocktail Party at The Bradley-Hubbell Homestead, 5 – 8 pm . Bring whatever you like to drink and some kind of nibbles or hors d’ouvres. This is the second of these events this summer. Those who attended the first one on June 28 had a fun time. See you there. FOR IMMEDIATE RELEASE – Revised Information about the Vintage Baseball Games coming up on Saturday, July 13. The Historical Society of Easton and Easton’s Department of Parks and Recreation welcome you to a wonderful summer day celebrating the national pastime with vintage baseball games on the field at Veteran’s Park, 366 Sport Hill Road, Easton, CT on Saturday July 13th(Rain date: July 20th). The Friends of Vintage Baseball, a reenactment group, will hold two exhibition games in Easton on the field behind the Easton Community Center for all to enjoy. To reach Veteran’s Park, enter the Helen Keller Middle School driveway and take a left at the wooden sign for the Easton Community Center and Veteran’s Park. The Friends of Vintage Baseball promote living history by bringing the 19th Century to life through baseball events using the rules, costumes, and equipment of the 1860 to 1880’s. baseball game. The first game starts at 11:00 AM and the second will follow at approximately 12:30 PM. Century as baseball began capturing America’s imagination. Play Ball!!! Since seating is limited at the ball fields bring lawn chairs for your comfort. 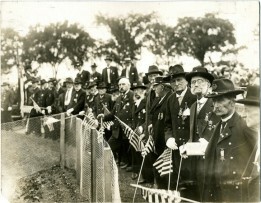 There are concession stands, rest room facilities, and handicapped parking available at Veteran’s Park. Why not join us for a special summer day enjoying the grand old game and learning more about our national pastime. For Veterans Fields the address is 360 Sport HIll Road in the Helen Keller Middle School Complex. Enter the driveway and drive past the middle school by bearing left. Parking is on the right hand side with handicapped parking next to the fields at the bottom of the driveway. For additional information please call the Historical Society of Easton at (203) 261-2090 or email: hseastonct@gmail.com. Website: http://historicalsocietyofeastonct.org . Step back in time with the Historical Society of Easton who is delighted to host Kathy Maher, the Executive Director and Curator of the Barnum Museum in Bridgeport for a special program, “The Life and Legacy of P.T. Barnum” on Thursday, May 9th at 11 AM in the Community Room at the Easton Public Library. Ms. Maher’s presentation will explore the multi-faceted P.T. Barnum – businessman, entertainer, philanthropist and politician – and bring his spirit back to life. His name alone conjures up the imagination with ideas both spectacular and extravagant. 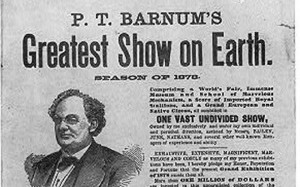 Known world-wide as the “Great American Showman”, Barnum accomplished far more than create shows of curiosities and oddities. P.T. Barnum served the Bridgeport community as Mayor, was instrumental in founding Bridgeport Hospital working as its first president plus contributing as an urban developer, educator, philanthropist and benefactor. He embraced the idea of a truly democratic nation and in doing so inspired a place of opportunity, knowledge, and wonder. 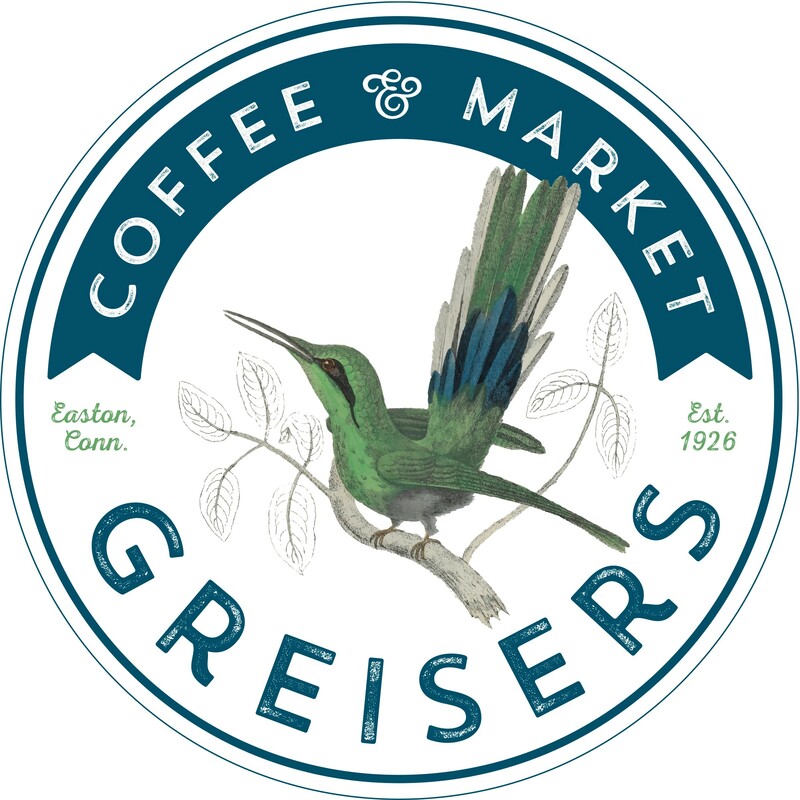 So learn more about this Connecticut showman and join the Historical Society of Easton for Kathy Maher’s insightful lecture on Thursday, May 9th at 11 AM at the Easton Public Library, 691 Morehouse Road, Easton. 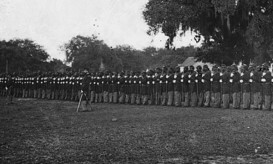 March 16 – Civil War Lecture next Saturday, at The Easton Public Library ( 2:00 pm – 3:30 pm). A little over two hundred years earlier, and halfway around the world, a similar event took place in the skies above New England. 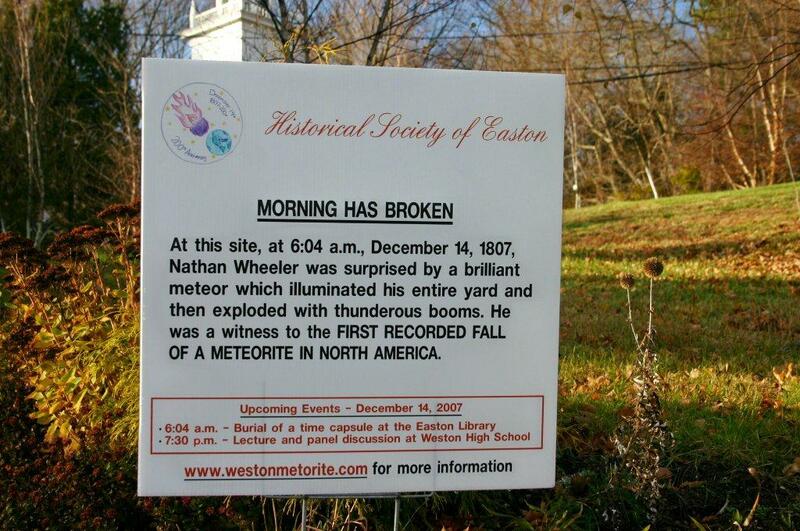 In the early morning hours of December 14, 1807 the peaceful rural quiet was shattered by a passing meteor exploding over the eastern part of Weston, Connecticut, an area which would in 1845 become Easton. There were several eyewitnesses, but at a time when news travelled by horse and foot their story took days and weeks to reach the outside world. Over the next two centuries, despite its importance as the first recorded fall of a meteorite in North America, the Weston Meteorite’s location became lost in confusion and rumor. The Historical Society of Easton will present an exhibit at the Easton Public Library (691 Morehouse Road, Easton, CT) from March 27-April 30, during library hours, describing the results of research to re-discover the actual fall sites of the Weston Meteorite and ultimately correct its location in the scientific literature. April 6 – In celebration of 150th Anniversary of President Abraham Lincoln’s Emancipation Proclamation and a tribute to Black History Month, the Historical Society of Easton will host a lecture about the rocky path to emancipation. Event to be held at The Community Room of the Easton Public Library, 691 Morehouse Rd., 2:00 pm – 3:30 pm. 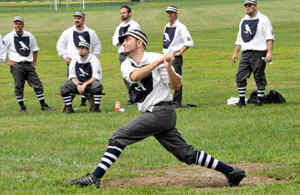 The Friends of Vintage Baseball, a reenactment group, will hold two exhibition games in Easton on the field behind the Easton Community Center for all to enjoy. Between the games, children will be invited onto the field to learn the rules of the 19thCentury baseball game. The first game starts at 11:00 AM and the second will follow at 12:30 PM. Admission fees: Adults and Children over 5 years old: $ 5.00, Families of 4 or more: $20.00, Children under 5: Free. There are concessions, rest rooms, and handicapped parking available. This event is made possible by the generous support of Easton Parks and Recreation.